Rumblings began on Friday morning that the Orioles and center fielder Adam Jones were close to finalizing an extension that would keep the O’s star in Baltimore for the foreseeable future. This news sort of came out of nowhere, and for O’s fans it was absolute music to our ears. Jones has been a guy who has been outspoken over the years about his displeasure with losing, and many fans feared the worst – that the young slugger would bolt B’More first chance he got to sign with a powerhouse like Boston or New York, or with a west coast team like San Diego or Los Angeles to be closer to his home. Instead, Jones has decided to try to see this Oriole turnaround through here in Charm City, as the deal was finalized over the weekend. The specifics of the contract – the largest in Oriole history, at six years and $85.5 million, eclipsing those signed by Nick Markakis in 2006 (6 years, $66 million), and Miguel Tejada in 2004 (6 years, $72 million). In an instant positive reaction to the news, Oriole Park at Camden Yards experienced its largest walk-up crowd EVER on Friday night. Now if that’s not a vote of public support – and a black-and-orange nation rising up immediately and declaring “if you commit to winning, we will come back!” – then I don’t know what is. The deal wasn’t even done yet, but just the fact that it was rumored to be in the works made O’s fans take notice, and want to go down to the Yard and support their first-place ball club. I’ll let the stat-heads argue over whether or not Jones is “worth” the money the Orioles decided to pay him. I’m a simple fan. While I absolutely recognize the value of sabermetrics, I still like stats like home runs, RBI, and batting average. In those categories (as well as several more advanced ones), Jones is the Orioles’ best player. That’s a guy I want around for a good long time. Signing him now, and making sure he will spend his prime years in an Orioles uniform, was really the only way to go. If Peter Angelos and Dan Duquette had let Jones have the chance to even test the free agent waters, many O’s fans would have considered it the last straw. Of course, since the rumor surfaced, the team is a wonderful 1-3, but let’s not let that damper our enthusiasm at the moment. AJ is here to stay. For the second time in 14 years, the Maryland men’s lacrosse team finds itself in the unenviable position of losing back-to-back National Championship games. After losing to Princeton in the ’97 and ’98 title games, the Terps failed to reach Memorial Day again until last season, when they fell to Virginia 9-7. With Monday’s 9-3 defeat at the hands of the Loyola Greyhounds, Maryland continues to be perpetual runners-up. It was another inspired run in the NCAA tournament for second-year head coach John Tillman’s squad, as they once again fought from an unseeded position to reach the title game. Just like last year, this string of wins featured a sweet victory over the rival Duke Blue Devils, who the Terps manhandled in the Final Four on Saturday, 16-10. There are no medals awarded for semifinal victories though, and as sweet as beating Duke is for Maryland fans, that’s how bitter it tastes to come up just shy of the ultimate goal. Perhaps for the Terps to take the next step and finally capture their first national title since 1975, Tillman needs to find a way to put together a more complete regular season in 2012, one that will have the Terps facing an “easier” road to championship Monday by securing a high seed in the tournament. That will be easier said than done, as Maryland stands to lose many key contributors, including seniors Joe Cummings (31 goals, 19 assists) and Drew Snider (24, 7). Tillman lost several starters after last year’s loss to Virginia though, and still managed to guide his team to one win shy of a title. Terps fans, though disappointed now, have a bright future to look forward to. On the other side, Loyola and head coach Charlie Toomey completed an even more impressive beating-of-the-odds to claim their first national championship in team history. While the Terps rose to the top from the bottom of the NCAA tournament bracket, Loyola’s journey was a season-long affair which saw them go from unranked (not in the preseason top 20) to #1 in the country, to #1 overall seed in said tournament. While Loyola had played in the title game once before – in 1990, a 21-9 thrashing at the hands of Syracuse – they had never had a season quite like this one. Their only loss came in overtime to Charles Street rival Johns Hopkins, at Homewood, in overtime. Still, many saw them as overrated, despite victories over national powerhouses Duke, Ohio State, and Denver. The Greyhounds and Toomey – who was the starting goalkeeper on that 1990 team – put that chip on their shoulder and definitively brought home their first championship trophy. After an easy 17-5 win over Canisius in the opening round, the ‘hounds survived a scare at the hands of rival Denver 10-9 (their third victory over them in 2012, by a total margin of five goals) to earn the right to play at Gillette Stadium on Memorial Day weekend. They built a 7-3 lead over 2010 runner up Notre Dame and held on for a 7-5 victory, before crushing the Terps on Monday. Maryland took a 3-2 lead with 10:40 remaining in the second quarter. However, the Terps would. Not. Score. Again. In a defensive performance for the ages, Loyola held Maryland scoreless for nearly 40 minutes to end the game. Considering the Terps had hung 16 on Duke just 48 hours before, this was an even more impressive accomplishment. In a matchup that ensured the state of Maryland would bring home it’s first NCAA Division 1 Men’s Lacrosse Championship since 1975 – that is, by anyone other than Johns Hopkins – it is worth noting that a local product had a huge impact. Loyola graduate student Eric Lusby (Severna Park ’07) set a record for most goals in a single NCAA tournament (17) with his fourth against the Terps on Monday. “We knew what we had in our locker room through the whole year. It’s just been an unbelievable journey,” said Lusby. Congratulations to the Loyola Greyhounds, and thank you for bringing the trophy back to Maryland, where it belongs. 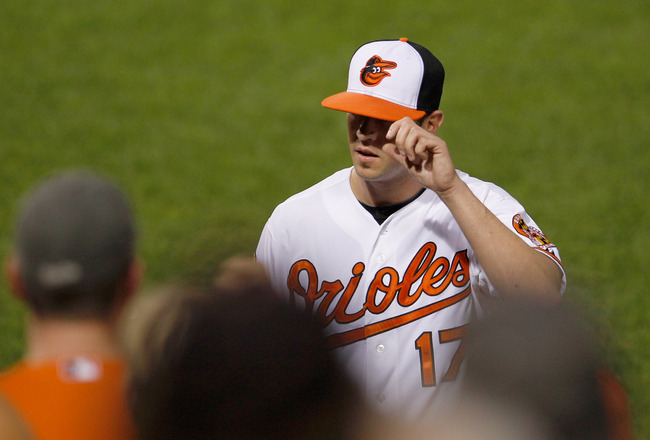 Brian Matusz has been on a roller coaster since his first day in the big leagues. We have seen the young southpaw go from once highly touted prospect that would soon be the ace of the Orioles pitching staff to injury prone bust and now a bottom end of the rotation guy who could either implode or hurl a gem on any given night. I have always liked Brian Matusz and wished success for him. This guy does have top of the rotation stuff and could one day be the Orioles number one or number two if only he can become more consistent. After watching Matusz throw a gem against Boston on Tuesday I wonder if he has finally turned the corner and moved on from a nightmarish 2011 campaign that saw him go 1-9 with an ERA of 10.69. If this proves to be the case, he picked a good time to turn that corner as the Orioles pitching staff has been having some struggles as of late. Opening day starter Jake Arrieta has not won a game since May 2 and his only other win came on opening day as he sits on a 2-5 record for the year. Arrieta has not pitched horrible but has shown struggle with his command leading to the inability to make it late into games. Jason Hammel, who should be a serious All Star contender, has also had some troubles since he was placed on the DL as he has not been able to make it into the 6th inning since his knee started to flare up. Tommy “Big Game ” Hunter has, like Arrieta, not been awful as he can almost always go 6 or 7 innings but sits on top of a 2-2 record with an ERA over 5, making it hard to say hes been successful but also hard to say he has not been solid part of the starting rotation. This kid has been trending upward since a rough start to the season by slowly deflating his ERA down from 9 to 4.86 while accumulating a .500 record at 4-4. If Matusz can keep improving like he has been his name could become a reliable fixture in the 5 man rotation, a big improvement from being the first name brought up whenever anyone would ask the question “Who gets sent down when Britton is healthy?” Although it still may be Matusz when or if that day comes he still deserves some respect as the Brian Matusz of May seems like a night and day difference from the first month of the season. The possibility of an all-Maryland NCAA Men’s Lacrosse championship final is within reach. It would mark the first time that two teams from the Old Line State played in the final since back in 1975, when the Terps knocked off Navy 20-13. Those that may be familiar with some of my past writings know that such a scenario would be absolutely ideal in my eyes. The only way it could be better is if the Final Four were again being held at M&T Bank Stadium this weekend, instead of up in Foxborough (where teams from our great state don’t seem to have the best of luck). It would be Maryland’s second straight appearance in the championship final, and the second for head coach John Tillman in as many seasons. It’s been a great run for the Terps, who came into the tournament having lost two of their final four games, which resulted in an unseeded position in the tournament and quite the tough road to New England. Tillman’s team responded though, slipping past Lehigh 10-9 in the opening round before putting on a clinic in perhaps their best performance of the season last Saturday. Maryland handled rival Johns Hopkins – the tournament’s #2 overall seed – in a way that has Terps fans once again thinking championship. The 11-5 victory over Hopkins gave the Terps just their second 2-0 season against their rival, and first since 1973. Maryland faces a stiff test to get back to Championship Monday though, with another rival standing in their way – the Duke Blue Devils. Maryland and Dook have split so far this season, with the Terps winning 10-7 in College Park on March 3, and the Dookies picking up the victory in the first round of the ACC tournament, 6-5 on April 20. The Blue Devils have won 12 of their past 13 games, with their only loss coming to Denver in Denver on April 27. They overpowered Colgate 17-6 last Sunday to reach their second straight Final Four, and will be will be looking for revenge after the Terps beat them on Championship Weekend last year by a convincing 9-4 score. On the other side of the bracket, the surprising Loyola Greyhounds, ranked #1 for most of the season and the tournament’s top overall seed, take on the Notre Dame Fighting Irish. Loyola has reeled off an extremely impressive 16-1 record so far in 2012. Even more impressive is that their only loss came in overtime to Johns Hopkins – they haven’t lost in regulation all year. The Greyhounds beat Canisius 17-5 in the opening round of the tournament before squeaking past Denver last weekend 10-9. If they can get past the Irish, it would be their first appearance in the final since 1990 (lost to Syracuse 21-9). So root hard for the Terps and Hounds this weekend. If they both win, we’ll be guaranteed to bring the NCAA Men’s Lacrosse Championship Trophy back to Maryland for the first time since 2007 – even more infuriating is that it would be the state’s first title by a team not named Johns Hopkins since that aforementioned 1975 win. If both squads fall, it would be a rematch of the 2010 final, won by Dook 6-5 in overtime over the Irish. Hopefully Monday I’ll have to choose one of the two teams to root for (most likely Maryland), but as a fan of the state and the sport, I won’t really be able to lose. Sounds like a great re-“lax”-ing way to spend Memorial Day to me. Ok seriously who are these guys and what have they done with our Orioles from the past 14 years? So far to date this team has showed us they are true competitors by hanging around late in games and despite not always winning they still manage to make some noise late and at least show us they are giving it all they have. But back-to-back come from behind wins in the 7th inning or later??? Two more extra-inning wins in three days? Never in my time as diehard Os fan have I seen this team play with so much gut and determination late in games. This team actually believes they can win every game and they should anyway with top notch players like JJ Hardy, Adam Jones, and Matt Wieters not to mention a bullpen that has been lights out since the start of the season; Hell, even Kevin Gregg has been a shutdown guy his past handful of appearances; if that doesn’t say Orioles Magic I don’t know what will. Buck really has these guys believing and its paying off. It seems the past’s regular trend of giving up 5 runs in the first three innings and then sending in a relief guy to do mop up duty while the offense dogs out the final 6 innings is thankfully out the window. Not this season…Buck would have their heads. Guys aren’t showing any quit – they are hustling late and its paying off. 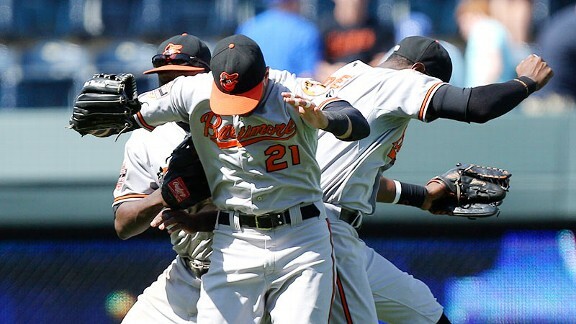 Just look at Ryan Flaherty’s game tying run scored in the bottom of the ninth on Wednesday where he just beat out the tag at home to send the game into extras, where again the clutch bat of Adam Jones reared its head as he blasted a 2 run shot that would prove to be the game wining home run. The Orioles are doing enough the small things right to win these games. Good base running, situational hitting, quality starts from pitchers and shutdown relief from the bullpen. If they can keep this up I see no reason why they cant shake things up late in the season with possible playoff spots up for grabs, and man how awesome would that be?! These guys are playing great for this city so lets all get out to the Yard and cheer them on. Oriole magic is making a comeback and we all have to do our part in supporting these guys who seem to really want to win for their city. Current Orioles J.J. Hardy and Bill Hall have been teammates before. From 2005-9, they were both members of the Milwaukee Brewers. That’s not the interesting part though. 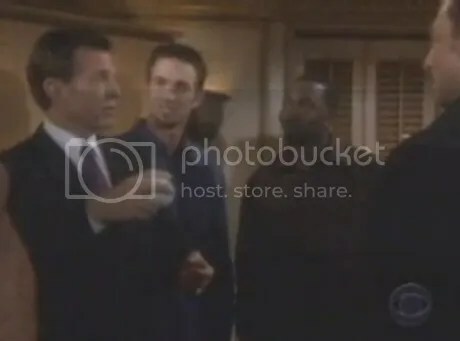 What I’ve just learned is that back in ’07, Hardy and Hall were – along with fellow Brew Crew members Jeff Suppan and Chris Capuano – on the soap opera “The Young and the Restless.” And they weren’t just background cameo spots – each member of the team had several lines in the scene. So what do you think, O’s fans? Do Hardy and Hall have a future in acting following their MLB careers? What is it with those scumbag Yankee fans always getting carte blanche to interfere with baseball games? We O’s fans hardly need to hear the first three syllables of the name “Jeffrey Maier” before going into involuntary dry heaves. Then there was THIS guy during the playoffs last year. 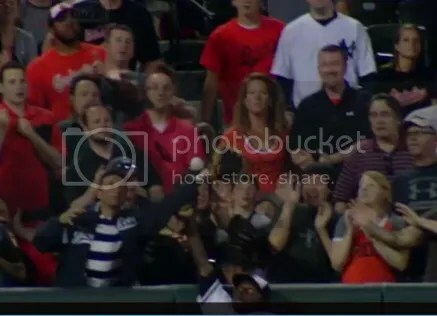 In Tuesday night’s O’s-Yanks contest, another Yanks fan pulled in what should have been an out and made it a home run. At the time, B’More was clinging to a 4-0 lead, and starter Wei-Yin Chen (4-0, 2.45 ERA) was working on a shutout with two outs in the top of the seventh. Curtis Granderson hit a long fly ball to the left field wall, where rookie Xavier Avery appeared to have a bead on it. And just like that, the Yanks were back in the game at 4-2. And just like in those previous instances, the umpires were completely silent. Luckily, Chen would record the final out in the seventh with no more damage done, and the reliable eighth-ninth inning combination of Pedro Strop and Jim Johnson closed out New York without allowing another run. With that, the O’s managed a split of the short two game series with the Bronx Bombers. More importantly, the O’s just finished their tough 15-game stretch – the one that many expected would prove to be their downfall – with an impressive 9-6 record. Take away the buzzsaw that is the Texas Rangers, and the Birds were 8-3 against the American League East during that stretch. That’s 3-2 against New York, 3-0 against Boston, and 2-1 against Tampa. Now the O’s need to prove that they can – unlike their purple NFL companions here in Charm City – beat up on the teams they are “supposed” to beat after beating the best teams in the league. Following up their impressive start to the month of May, Buck’s Birds need strong showings against teams like Kansas City, against whom they play five of their next eleven. Series against the fellow upstart Washington Nationals, the Toronto Blue Jays, and the revenge-minded Red Sox finish out the month of May for the O’s. Let’s keep the magic going. For the second time this week, Matt Wieters was involved in a collision at the plate, and for the second time, Wieters came out on top. Unlike in Boston on Sunday though, Tampa infielder Sean Rodriguez really tried to bring the lumber, throwing a forearm shiver to Wieters’ facemask. If Wieters had dropped the ball Sunday, the Red Sox would have won the game on the play. If he’d dropped it last night, Nick Johnson’s 2-run home run in the bottom of the seventh inning would have only tied the game, instead of giving the O’s a 4-3 lead they would not relinquish. Matt Wieters does not drop the ball. After the play, Buck Showalter and trainer Richie Bancells came out to check on Matt, who was bleeding from his jaw. If it were me, Rodriguez would have heard some chin music in his next at bat. Apparently that’s not something Buck is down with though, as we saw earlier this week with Josh Hamilton. Anyway, Matt Wieters. Watch it twice below – the first time on Gary Thorne’s MASN call, and the second time with Fred Manfra’s on radio. For the second time in three days, the O’s were involved in a piece of baseball history. This time, though, they ended up on the wrong side. Given the way they play against the Orioles, I’m really not sure how the Texas Rangers ever lose a baseball game. They haven’t scored 30 runs in one game (yet) in this series, but they have put up 24 runs in just two games. In fact, the score over the first two games of the four game series – Houston 24 Baltimore 6 – looks a lot more like a score you’d expect to see in a game where Joe Flacco threw three interceptions and Arian Foster ran roughshod over the Ravens’ defense (let’s hope this scenario never occurs). On Tuesday night, Texas wasted no time, going up 2-0 in the first inning on a Josh Hamilton home run. It would be the first of FOUR two-run bombs for Hamilton on the night, making him just the 16th player in MLB history to go deep four times in a single game. Hamilton, who also homered in his final at bat on Monday night (also a 2-run shot), added a double for good measure. Thus, in his last six AB of the series, he is 6-for-6 with five home runs, one double, and 10 RBI. Not a bad little stretch. Of course, if I were managing the O’s, Hamilton wouldn’t have had that many chances on Tuesday; instead, he’d have gotten a baseball right in his ribs the second time he stepped to the plate. He was way too comfortable in there against Jake Arrieta, who he hit his first two HRs and his double off of. Congratulations to Hamilton on the historic accomplishment. I still say he needs a ball right in the middle of his back, but I don’t think that’s something you ask Wednesday’s starter, Wei-Yin Chen, to do. As for the team, the O’s need to manage at least a single win out of this series. While a split is still theoretically possible, it doesn’t look very plausible given the way they’ve appeared so thoroughly outmatched against the Rangers. Getting swept on the heels of that amazing road trip would be such a pre-2012 O’s thing to do. And it would remind us all way too much of those pre-2012 years in Birdland. Come on, Chen, quiet those Texas bats down for a night. That one word pretty much sums up that past road trip for the Orioles. After taking their fourth consecutive L against division rival New York to start the 6 game trip, the frustration of being able to squeak out wins against lesser competition but never really being able to compete against powerhouses such as Boston and New York began to build in the minds of Orioles faithful. Was this just another great start that they would squander when it was do or die time against two of the annual playoff contenders (well almost annual, sorry Boston) or would they finally rise to the occasion and show these big boy clubs that they mean business? The Orioles stepped up to the plate and delivered, literally and metaphorically, going 5-1 on the trip including a sweep of the Boston Red Sox. I would have been happy if the Os would have gone 3-3 on this trip. I’m not about to get greedy when this club is playing some amazing baseball after 14 years of losing. Ultimately, 82-80 works for me. After watching our bullpen completely exhaust itself in Boston the O’s desperately needed a 6 or 7 inning start from Brian Matusz against the reigning AL champion Texas Rangers to give our relievers a much needed rest. Unfortunately, Matusz couldn’t get past the 6th inning – actually, he couldn’t even get an out in the 6th which would force Buck to bring in reliever Stu Pomeranz, just called up from Norfolk earlier in the day. “Stuuuuuu” as the OPACY crowd quickly came to know him, pitched 3 scoreless innings for the Birds. Things got ugly when Jason Berken came into pitch the final inning for the Orioles as he gave up 7 runs on 6 hits. Its tough to watch guys like Matusz and Berken get slaughtered as bad as they did. I honestly want both of them to be successful and be a part of this club. Matusz has been one of the more confusing players to watch develop. He got rushed into the majors and found early success but eventually fell of due to a shattered confidence and injury. One inning he will show us he is the the lefty ace we so desperately wanted him to be and then the next inning the wheels come off and he looks like another failed prospect that the team rushed through the farm system. I’m pulling for this guy. I really am – I want our ball club to be a contender and be successful. In a perfect scenario Matusz is a big part of that happening but right now he just doesn’t have the confidence it seems to bounce back after giving up a run or two which leads to the implosion we have seen far to0 many times for a starter at the major league level. I’m not about to panic though; why should I? So arguably one of our weakest starters gets lit up by one of the best teams in baseball, The Rangers aren’t the twice repeating American League Champions for nothing. This season is a marathon not a sprint – the good clubs are the ones who get shelled one night and then bounce back from it and I think this club is more than capable of bouncing back. With the bullpen getting a full day’s rest and Jake Arrieta set to pitch tonight I think we stand a pretty good chance. In a worst case scenario Arrieta can take us deep enough to give our relievers another day off and prevent us from dipping into the bullpen too early. So stay positive Oriole fans and get out to the yard at some point during the homestand to cheer on our guys, Ill be there and you should too! You are currently browsing the Bmorebirdsnest's Weblog blog archives for May, 2012.